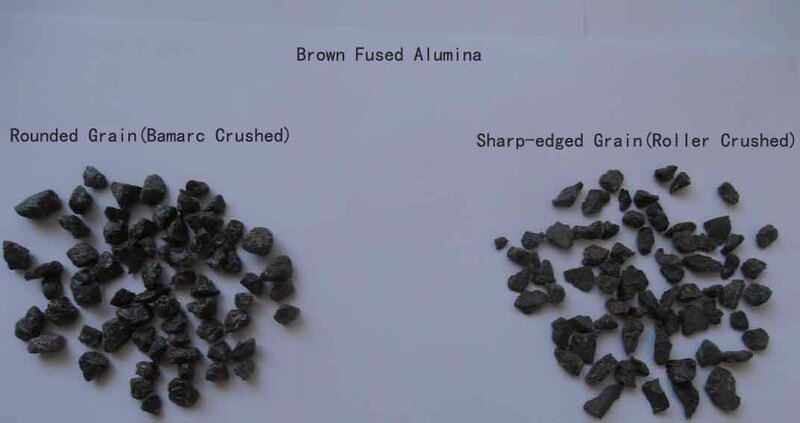 When you send inquiries on Brown Fused Alumina(Fused Aluminium Oxide), do you actually know every detail of the material you need? Besides furnace type(fixed furnace & tilting furnace), in which way BFA is crushed/milled also effects the physical performance of the material you get. In China, there are 3 main types of crusher/mill for BFA, which are Roller, Bamarc and Ball Mill, and the first two of them are the mostly used by producers. Roller crusher crush/mills BFA by pressing lumps naturally into grains of different sizes which fall into different FEPA size numbers like F24,F36,F60....F220 for abrasives, or 0-1mm,1-3mm,3-5mm etc for refractoires. Barmarc make the BFA grains by centrifugal force, the big grains of BFA are re-made in Bamarc machine which rock & roll the grains by centrifgal force into smaller grains. Bamarc crushed grains are rounded grains compared to roller crushed ones, or we can say that Bamarc materials have higher Bulk Density, which is usually measured in g/cm3. See picture below which shows shape of the two materials. With the remake by centrifugal force, Bamarc materials are more purified. Although difference is minus, it is with higher useful chemical contents like Aluminum Oxide(Al2O3),Titanium Oxide(TiO2) etc. Bamarc materials are tougher,while Roller materials are more breakable.This feature is important for sandblasting purposes. You use less bamarc materials by blasting the same weight/area of metal. Bamarc materials are with less magnetic contents. Because of above differences, Barmarc materials are better for making grinding wheels/cutting wheels, or for blasting or surface preparation. Bonded wheels made by it are more tougher, sharper, more efficient and emit less heat and attached varia. Also look deeper in color, with less crack or rusty spots, which is especially abvious when make refractory products, like refractory bricks. And at last, Bamarc materials are higher in cost than Roller materials as all goods materials are. This is because of lower product output by Bamarc machine for the same amount of BFA lumps.